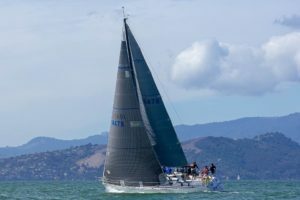 The Berkeley Yacht Club was host for the 2018 Express 37 Nationals. The three day event kicked off on Friday, September 28th and finished on Sunday, September 30th. The sailing venue was primarily the Berkeley Circle of San Francisco Bay. The twelve team field consisted of boats from northern California along with a team from southern California. 1st place went to Shawn Ivie and crew on Limitless, followed by Bartz Schneider skippering Expeditious in 2nd, and 3rd place went to Brendan Busch on Spy vs Spy. Racing kicked off on Friday with breeze from 12 to 15 knots. Just prior to the first start, Golden Moon and Elan collided and both boats returned to the marina to access damages. Team limitless was over early in race one but battled back to finish first across the finish line. 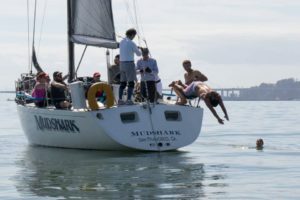 Due to their proximity to the collision, Stewball was late to the start line but despite this bad start, the team managed to climb back and finish second. After assessing the damage, Elan determined they were out of the remainder of the regatta. Golden Moon patched their hole and returned to join the fleet for race two. Wind conditions remained similar to the first race and Limitless grabbed another first. Saturday was designated for the “distance race.” However at the days start, the wind was not cooperating. 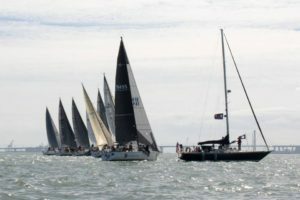 The first race kicked off at 11:30 in the morning with 5 to 6 knots, resulting with the wind dropping towards the end of the race and the boats in the back of the fleet having a very slow slug to the finish. The fourth race was postponed a half hour and the signal boat was moved a half mile west. Soon after the signal boat moved, a 10 to 15 knot westerly came in and the 15 mile distance race was on. Spy vs Spy took first, Golden Moon came in second, and cumulative results were now shuffled with many ties. The final day of the nationals started with 4 to 5 knots of breeze shifting from all directions. By the time the first race was scheduled to start, the wind had vanished with the entire San Francisco Bay turning to glass. The sailing instructions stated no races were to be started after 14:30. Finally, at 13:15, a wind line approached from the Gate and at 13:35 a race was started. 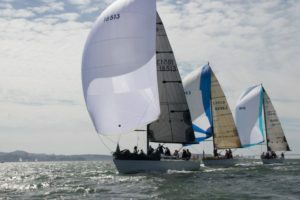 The 10-13 knots of breeze was enough to get a fifth race in but not enough time was left to start the sixth race and the nationals had concluded. Race five saw Golden Moon picking up a first place with Expeditious taking second. A big congrats to the teams for making the Express 37 Nationals a success. Also a special thanks to race committee member Bobbi Tosse for all the information on the championship report. Taylor, Where did you source the great photo of Expeditious 18478 in your article? Could I please have a large format copy of it?